So late one recent evening, Hereford and I found ourself uptown again looking for a burger to devour. We eventually went to check out The List, as well as our Twitter and Facebook, messages to see what good suggestions people have sent to us. It just so happened that earlier that day Queen City Q invited us out to try a couple of their burgers. 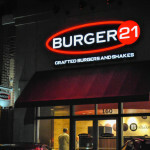 Now we never turn down a challenge 1, especially one that involves burgers. So we headed to 6th street and parked at the famous 7th Street Parking Deck. I almost got down on my knees and hugged this door. YES! More restaurant should take a note from Queen City Q because I already want to come back for a second time and I haven’t even tried their food yet. And speaking of food, we were shown to our seats, kinda got ignored by our waitress and ordered our burgers. We were not asked by our waitress on how we wanted our burgers to be cooked, but I’m not exactly shy, so I asked if our burgers could be cooked a certain way. And, of course, I got a blanked “…yeah” (I will cover this more in depth in the Atmosphere section). So I asked for mine to be rare and she immediately fired back with “we can do medium-rare”. When our burgers arrived at our table I was not impressed by the presentation of the whole thing. I wasn’t underwhelmed or anything, but I also wasn’t overwhelmed. I was just, whelmed. Hereford’s looked fine. His plate was full of fires. But mine, reminded me of a cafeteria plate where they plop the food down and hand it back to you. Nonetheless, I was ready to eat my burger. Biting into the burger I found that it was cooked one step up (medium) but it was still really juicy. You can really taste the three different cuts of meat in this burger, which gave it a nice texture. The cheese was amazing and so was the bacon, I just wish it had more of the latter. The bread was toasted and held up to the juiciness of the burger, but the lettuce was garnish and should have been used to dress up the plate itself. 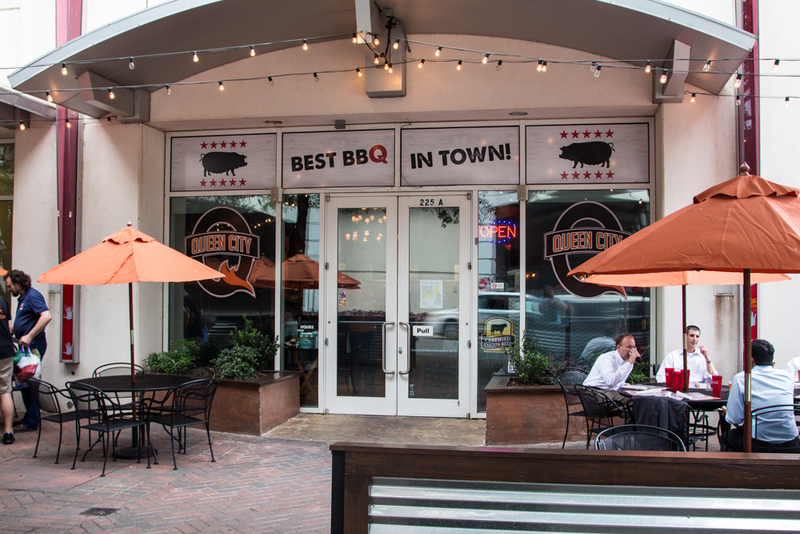 Queen City Q is better known for their barbeque having won Charlotte Magazines BOB Award for (you guessed it) Best BBQ. 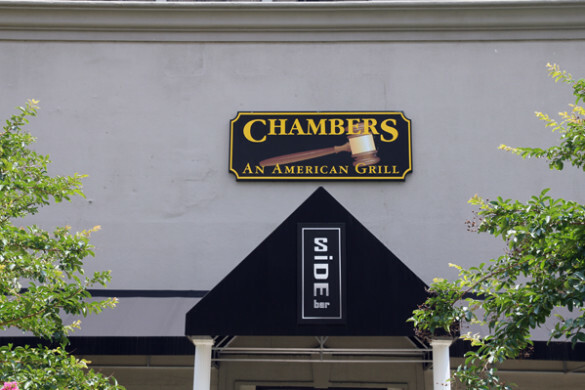 They have offerings of all types of barbecue, ranging from pulled pork, texas brisket, and St. Louis style ribs 3. They have a wide variety of sandwiches and even some quesadilla and taco options. For my side I opted out of the fries and instead got the Best Mac and Cheese. Now My mom makes a mean macaroni and cheese and I make a pretty great one myself 4. So I am a snob when people say they have the “Best Mac and Cheese” (maybe more so than when people say they have the “Best Burger” 5 To put it honest to you, this was probably the best mac and cheese that I have eaten (ok, maybe not as good as my mom’s), but still it was pretty amazing. I just wish I has more of it than a spoonful. 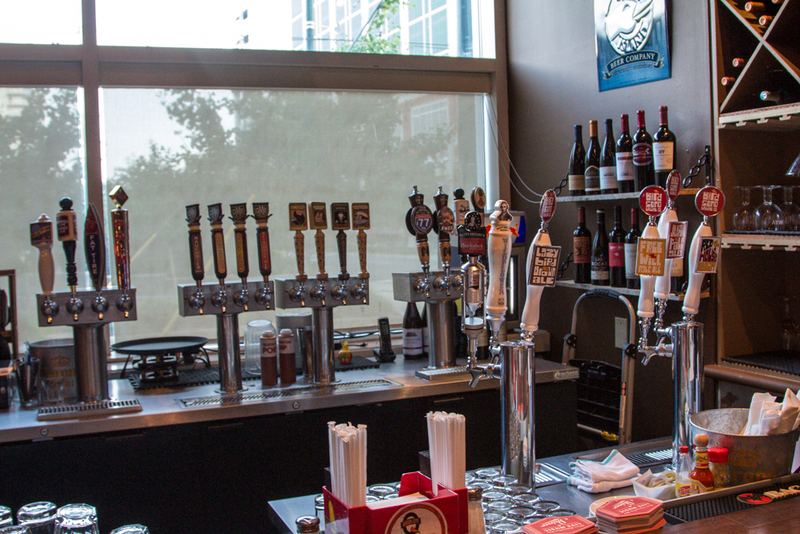 Queen City Q might be the best place to get draft beer. I say that because it looked like they carried every Charlotte brewery and Carolina brewery on their taps. They had local beer from Olde Meck, Noda, Birdsong, Four Friends and state beers from Lone Rider, Big Boss, Foothills, Carolina Brewing, Natty Green and Highland! Now I am not just talking about 1 beer from each. They probably had every single available beer out at the moment for each of the local breweries, and at least 2 from each of the state brands. If not more. 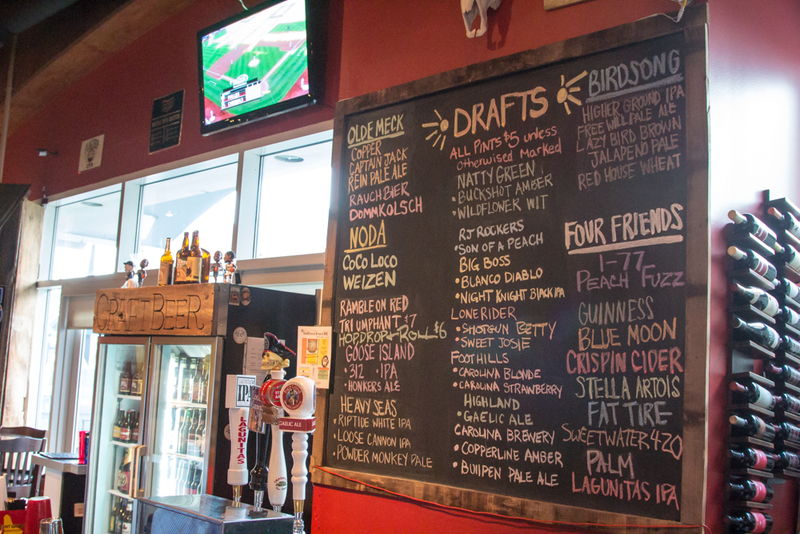 And this is not to mention the extensive list of bottles they have of all of the other major craft breweries out there. And thinking back on it, and looking through the photos we took, I cannot tell if they carried any of the big three at all 6. Well I am going to say it. 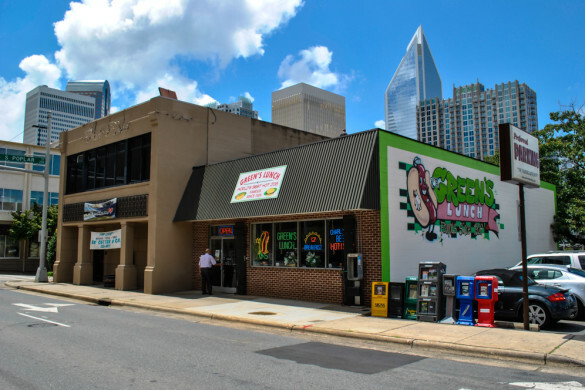 Short of going to the breweries themselves, Queen City Q is in the highest echelon of beer places in Charlotte. I mentioned earlier how our waitress was kind of non-existent and distant in that “I really don’t care why you are here and I really hate my job” kind of way. 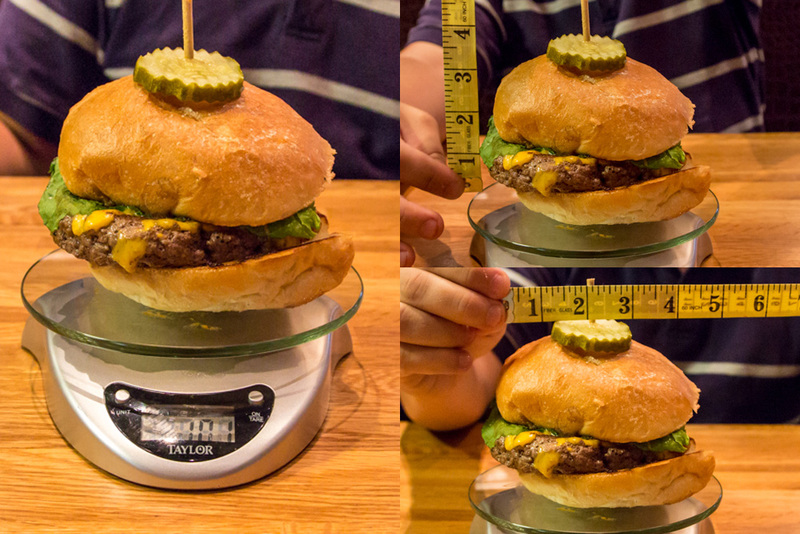 We have said before that we might cause tension with servers coming in with our crazy looking food scale, measuring tape, and wacky looking picture taking machine. But, really, it probably isn’t. Now we are sensitive to a wait staff’s needs (Hereford’s girlfriend part-times as a waitress) so we know how it is. So we are going to chalk up our bad experience with our waitress as her having a bad day. We all get those and most of us don’t have to put up with customers most of our day 7, so yeah. Bad day. No big deal. Also I was still pretty pumped throughout my whole meal about my parking being paid for. So I call that a win-win. 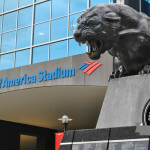 What was your favorite thing (non-food) about the Queen City Q? 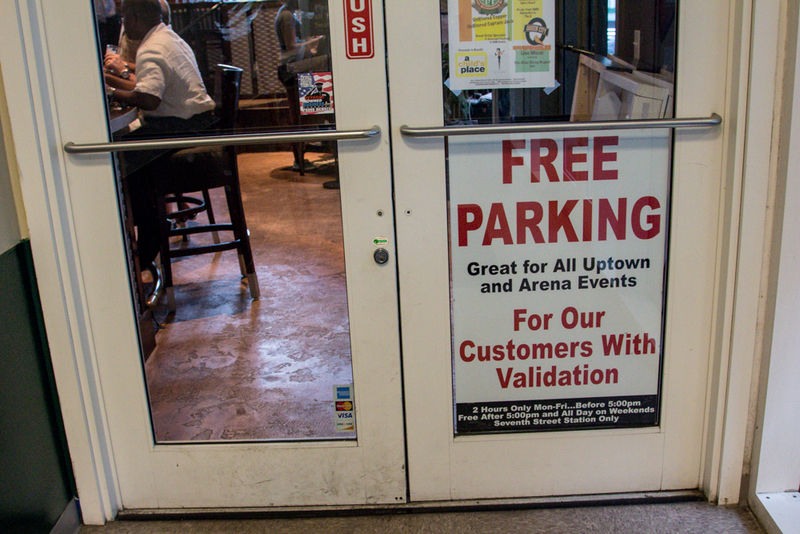 Totally them being awesome in validating your parking so you didn’t have to pay $5 (Maybe $10 on eent days). I think I would go for their ribs or their brisket. Probably both. What beer did you drink? Hereford had the Jalapeno Pale Ale from Birdsong. He made me try it. Surprisingly, although I don’t like jalapenos, it was okay. I had a Captain Jack from Olde Meck, then followed it with a Carolina Blonde. 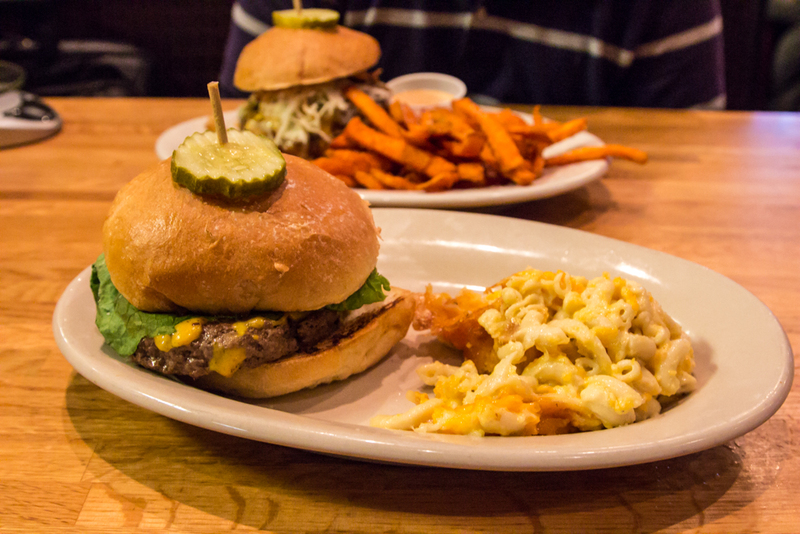 Does Queen City Q Grill earn the Charlotte Burger Blog Seal of Approval? 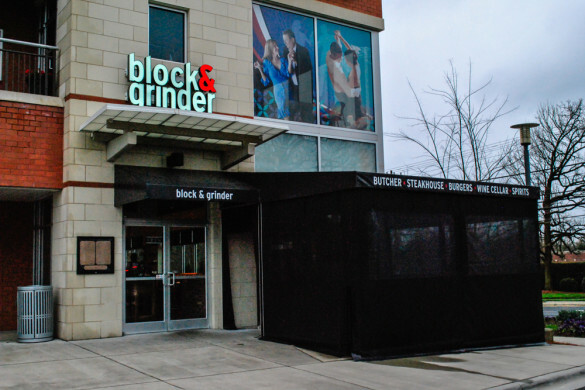 Even though validated parking should give them a seal, I cannot deal one out since their burger didn’t really hit that mark in the overall presentation and taste.